Over the past decade, many businesses have shifted from the traditional brick and mortar structure to the more dynamic ecommerce platform. This is because ecommerce opened the doors for them to reach out to targeted clients and new markets, which are no longer bound by geographic limitations. Ecommerce has also helped a lot of individuals in starting up business ventures with a smaller capital, as its requirements cost a fraction of the traditional investment price. Hence, if you are looking for an ecommerce platform that allows you to showcase your products and services to your target audience, then you may as well check out what Shopify.com has to offer. The most established ecommerce platform today, Shopify.com is currently catering to over 50,000 online entrepreneurs since it first started, making it one of the biggest online store builders you can find. Content management system. 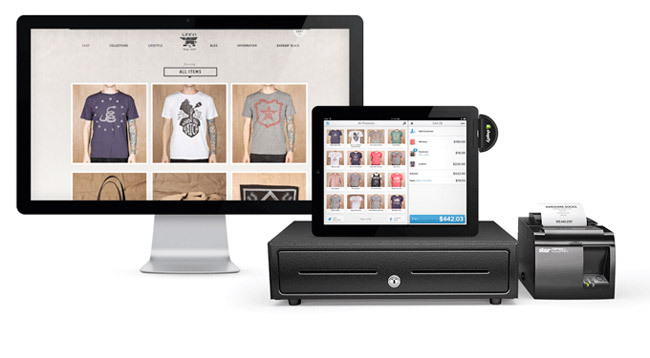 Shopify.com’s ecommerce platform package includes a content management system that gives users a helping hand in managing inventory, edit HTML and CSS codes, create codes in the form of coupons or checkout discounts, and accept payments online using credit cards or processors such as PayPal. API platform and App Store. Shopify.com also has an API platform that provides the materials developers would use to create custom applications for their online stores under the brand’s ecommerce platform. These apps can likewise be sold on the Shopify App Store. There are over 150 different free and paid apps that give additional functions to store owners. These are used by many firms such as MailChimp, Olark, Ordoro, FreshBooks, and QuickBooks, to name a few. Shopify Theme Store. Shopify.com also has a database of themes which can be purchased by clients who wish to perk up their online stores. Similar to WordPress themes, Shopify.com offers a wide variety of themes that match different themes and industries; this way, online store owners are able to make their pages more enticing to explore by their target market. Shopify Experts. 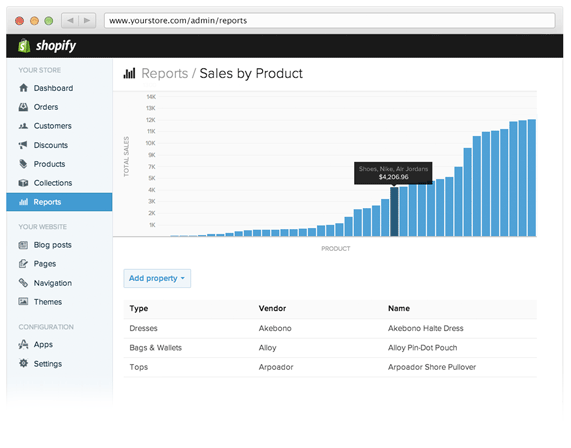 Another feature found in the Shopify.com platform is the Shopify Experts. It serves as a directory of Shopify professionals for users to contact. This directory is subdivided into different categories, Developer, Designer, Photographer, Accountant and Marketer-SEO. The great thing about Shopify.com is that its platform is mobile-compliant. This means if you are running an online store using its platform, your site can be viewed and accessed on mobile devices, and the same features found on it can be used by visitors, including picking products, checkout and payment. Starter. The Starter package costs $14 per month, and comes with a two week trial. In this plan, you are provided with unlimited hosting, ready-to-use templates, and a secure checkout. You can also sell up to 25 products and accept payments via Paypal and credit cards. There is no coding required in this package, as it already comes with pre-made site structures that you can use right away. This plan is also flexible; you can upgrade to a bigger plan as your needs grow. Basic. 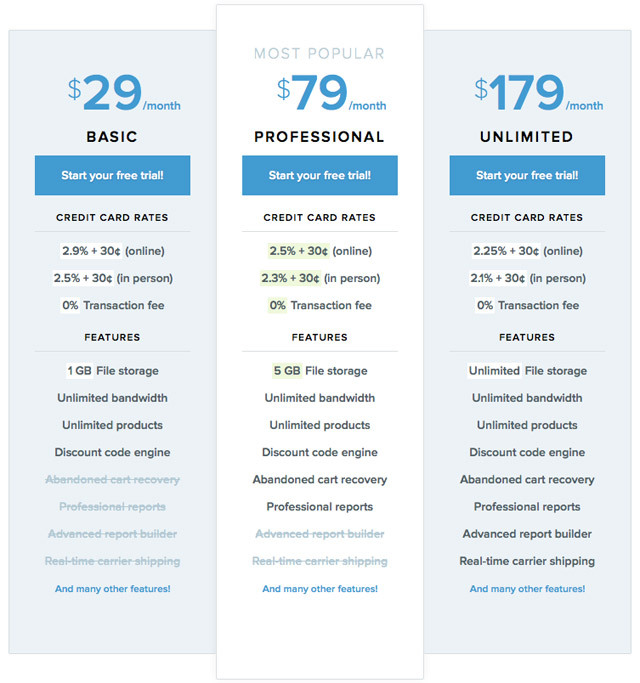 The Basic package costs $29 per month, and includes free setup, the use of your own domain, unlimited bandwidth, 1GB file storage, and up to 100 products for upload and display. This plan requires a 2.0% transaction fee for purchases made. Professional. The Professional package costs $79 per month, and is currently the most popular among the packages under the Shopify.com platform. It includes the same features as the Basic plan, but has up to 2,500 products for upload, 5GB file storage, 1.0% transaction fee, and a discount code engine. Unlimited. The Unlimited package costs $179 per month. It covers the same free setup, use of your own domain, unlimited bandwidth and discount code engine. However, It also features unlimited number of products for upload, unlimited space for file storage, no transaction fee, and real time carrier shipping. Enterprise. The Enterprise package is a special plan offered to bigger companies who are aiming to reach a bigger market and sell up to 1 million products per year. This is a custom made plan though, so interested parties would have to get a quote first. 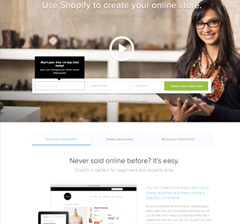 Aside from the service packages, Shopify.com also sells several themes that can be used for online store websites. These themes vary in price, as they are specially designed and developed to cater to specific ecommerce needs. According to user reviews, Shopify.com offers near excellent service when it comes to laying down the foundations of an online store. The main drawback in using the platform however is when purchasing and installing custom made themes; it takes a long time for the themes to be uploaded on the platform, making it a chore for developers and site owners to wait before their online store can be ready for final tweaks. A good alternative to this is to use the already available themes on the service plan purchased, and do certain design upgrades later. 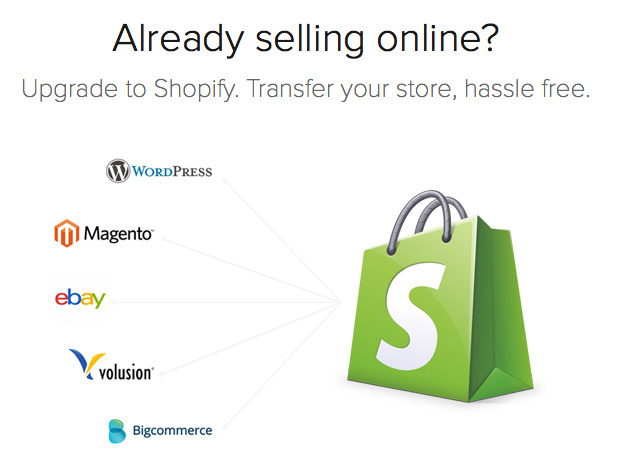 The customer support system of Shopify.com is available 24/7 and can be contacted via phone, email or chat. It also has an ecommerce support line, where sellers may ask for advice from ecommerce experts about how to market their products effectively via the Shopify.com platform. This is a great thing as sellers, both pro and amateur, are able to learn new tricks from industry experts and soon get their ROI within a shorter period of time. Shopify.com offers convenience for online sellers, from the amateurs to the already established ones. Rather than having a site custom built for ecommerce, the platform already provides the space and materials that could be set up within a few clicks so that users can start selling their items in real time. If you are an online entrepreneur looking for the easier way out in establishing your business on the internet, then this is the platform to use. You can also form a network with other ecommerce sites that are using the same platform to gain better access to new potential markets.